A self-proclaimed Luddite and a diehard skateboarding enthusiast, Oakland-based artist Ken Davis embodies a tangle of seemingly contradictory idiosyncrasies, which is precisely the reason his art and the thought process behind it is so fascinating. Davis received his training as a traditional sign painter, and his personal work certainly reflects his respect for the time-honored craft. 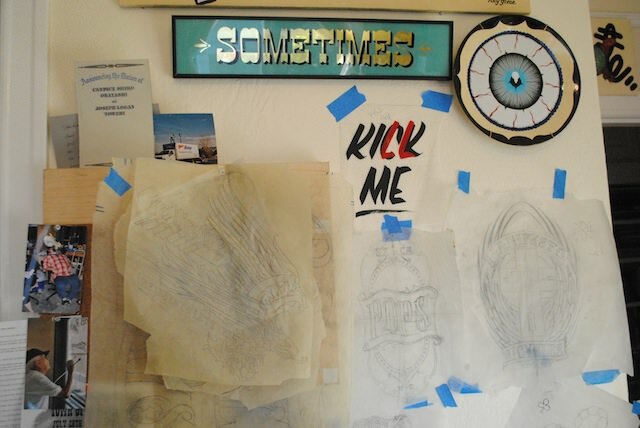 He renders skulls, decaying body parts and punchy slogans with the precision of a Victorian-era craftsman, using lavish materials like mother of pearl and gold leaf to create motifs inspired by his early days in the punk rock, skating and graffiti scenes of the Bay Area. 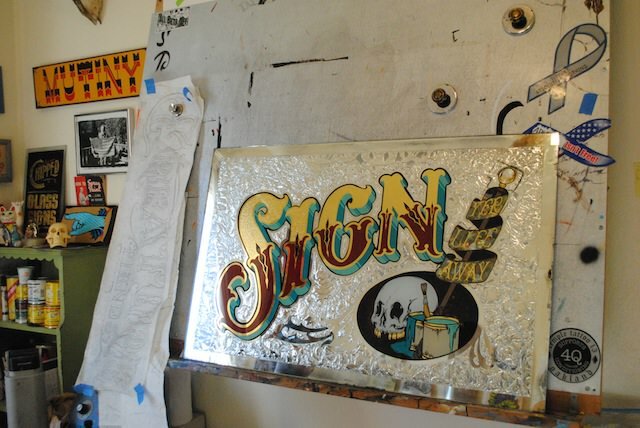 Nastia Voynovskaya sat down with Davis in his studio to find out more about his work and the esoteric world of sign painting. What sparked your interest in traditional craftsmanship? What started it was just me teaching myself how to paint signs a number of years ago. 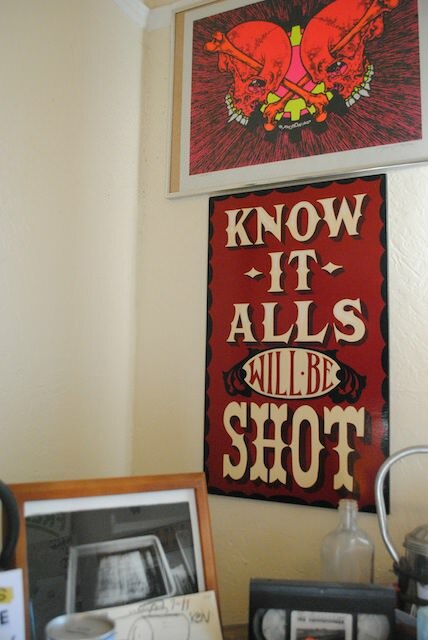 Anything you teach yourself, at some point you’re like, “Maybe I should learn how professionals do it.” And so, I fell into an apprenticeship painting signs with Josh Luke [at New Bohemia Signs in San Francisco]. I saw a piece of his at an art show, and I had to figure out who did it. It turned out he’s a skater and I skate so we has weekly skate dates, and one day he just poses to me “Do you want an apprenticeship?” … Within a six months period or something crazy he had to move to Boston with his fiance because she was going to grad school, so I turned into him basically. Over six months it was a crash course in doing everything Josh does. So then you took over his job? More or less. I mean, you can’t take over Josh’s job, he was just a monster, a super dedicated guy… From there I started looking into different techniques of sign painters, just seeing the natural progression… If I can put strokes on walls and glass, why not take it to the next step and do embossed glass and these Victorian techniques that were lost until this guy Rick Glawson came and devoted his life to figuring it all out. It’s interesting that you’re so immersed in a world of artists that are more craftsmanship-oriented because they seem to be outside of what’s trendy [in the contemporary art scene]. Most artists who are interested in skateboarding culture don’t do work like that. I’ve definitely always had a desire to work with typography, I guess… Some [sign painters] are the most genuine people I have met. They have these kind of communities just because, like you said, they’re not concerned [with trends] and half of them don’t even know what a gallery is let alone where to go for one… Everything has already been done, and it’s your responsibility as a creative person to reinterpret it and make it your own, which is what they all do. 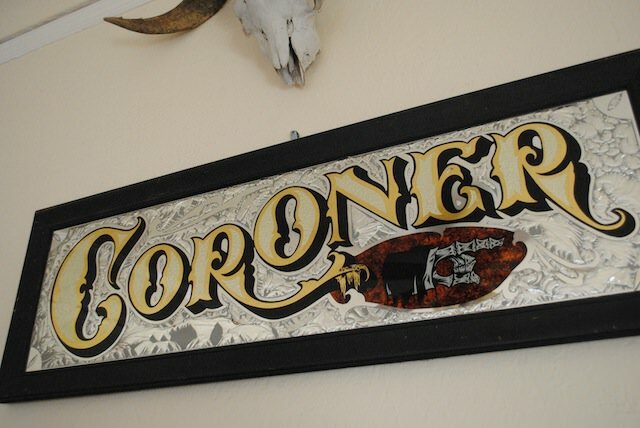 A lot of the wording in your signs as well as other traditional sign art is humorous or uses puns. A lot of your work — like, the skull imagery — seems derived from punk and metal album covers. Is that what you’re into? I grew up around punk and all that stuff in the East Bay. But I wasn’t that political or into what’s going on until the last couple of years. Being self-employed really changes your outlook on things because you really care about where your money is going. 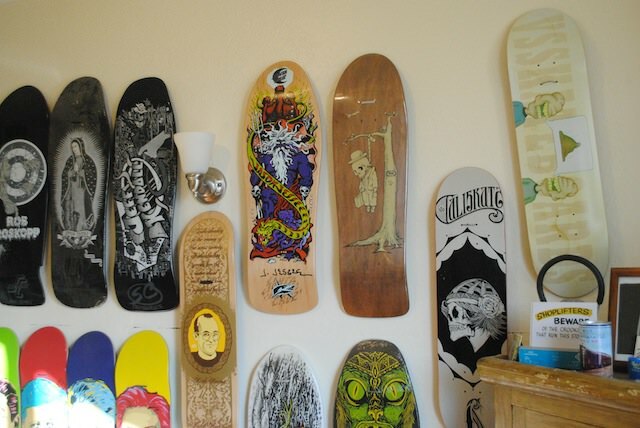 The punk and metal stuff, I grew up as a skate kid, so you can’t escape it, as you can see by my wall of skateboards. Did the art on skate decks you saw growing up have an impact on you? Of course, what skate kid didn’t look up to Jim Phillips? I grew up in the early-to-mid ’90s skateboarding [scene] so what Todd Francis was doing for Anti-Hero, what Todd Bratrud was doing for Consolidated was just mind-blowing to me. That “Congratulations, it’s a man” deck that Todd Bratrud did was brilliant to me.. It had a doctor holding this baby-man, it was the weirdest thing in the world but I identified with weird because in the ’90s skateboarding was not as cool [as it is now]. 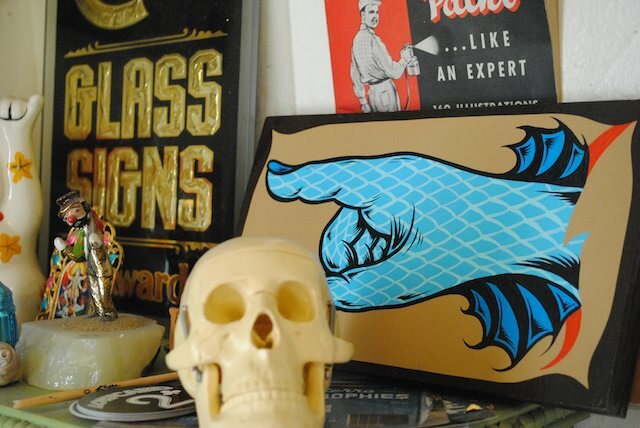 What do you think of artists like Eine, for example, who borrow from the sign painting tradition? It seems like he’s turning into a spokesperson for sign painters for outsiders. I don’t know what spurred the resurgence in interest in hand-painted signage. I have a couple theories. One of them is just the interest in the craft again, people are getting really into hand-doing everything… A lot of the people that want hand-painted signs grew up seeing the dot-com busts… As for me, it is kind of a rebellion from tech. I don’t have the Internet, I know how to do graphic design but I choose not to. Did you ever write graffiti? I had a stint, a couple of productive years… I met some of my best friends throughout that world and I still contact them and they still go as hard as they did when they were 18 and I think that’s awesome. But I like being warm inside and painting signs. 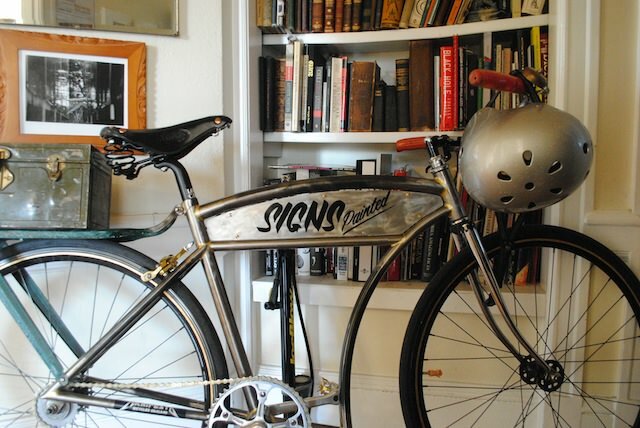 I like to take my time on things, which was always a hang-up… My graffiti always ended up looking like signs anyway.